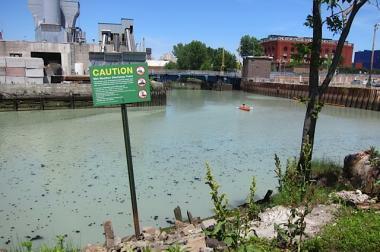 A canoer on the heavily polluted Gowanus Canal. GOWANUS — National Grid customers in Brooklyn, Staten Island and parts of Queens will see hikes to their heating bills starting next month, with another rise likely next year due in part to the cleanup of the notoriously polluted Gowanus Canal. Despite objections from state and city lawmakers, retirement group AARP and others, the state's Public Service Commission voted unanimously Thursday in favor of a bill increase for the utility. The typical monthly heat bill will go up about $9.40 a month starting in January. The rate increase will fund $3 billion in infrastructure improvements, reduce methane emissions and enhance storm resiliency, a spokeswoman for the utility said. In 2018, the utility will likely tack another 2 percent surcharge onto monthly bills to cover its share of the cleanup costs for the contaminated canal. National Grid must pay for some of the canal's cleanup because it's considered a "responsible party" — or polluter — in the U.S. Environmental Protection Agency's $506 million Superfund cleanup. Representatives for AARP and the Public Interest Law Project said they were "extremely disappointed" with the bill increase, which they described as "unfair." "At least some of the hike approved today by the Public Service Commission could easily have been avoided," AARP New York state director Beth Finkel and PULP executive director Richard Berkley said in a joint statement. "But state regulators for whatever reason — and in a break with precedent — chose to saddle ratepayers in Brooklyn, Queens and Staten Island with the entire $715 million cost to clean up pollution in and around the Gowanus Canal and Newtown Creek resulting from operations by now-shuttered utility facilities. "Shareholders should pay at least part of the bill for the anticipated Superfund investigation and remediation costs caused by National Grid subsidiary Keyspan-owned facilities in the area that are no longer in operation." They added, "This liability was known at the time of the purchase of these companies by National Grid, and it’s simply not fair to impose its costs on current ratepayers." National Grid says it will only hit customers with the 2 percent surcharge if its cleanup costs exceed $25 million, but advocates for utility customers say that's almost certain because the utility's cleanup costs will be at least $700 to $800 million, according to research by the Public Utility Law Project. "We believe today’s unanimous decision by the New York Public Service Commission achieves a fair and reasonable outcome for our customers and stakeholders," National Grid spokeswoman Karen Young said in an email. "After a decade of rate stability, the new rate plans levelize bill impacts by spreading costs over three years." In addition to the canal itself, National Grid must pay to decontaminate three properties it owns next to the canal, including the future site of the Public Place 774-unit housing development and at "Double D" pool. The canal and surrounding land were polluted decades ago by factories that produced manufactured gas, a staple energy source used for cooking, lighting and heating in the 1800s. The process left the area laden with toxic coal tar and, when National Grid acquired the companies that once operated those facilities, it assumed responsibility for cleaning up the pollution.